I tried to have this post up last Friday, but time wasn't on my side. I was busy prepping for my trip to Orlando, specifically Lake Buena Vista, this past weekend where the family and I attended the 2012 International Food and Wine Festival at Epcot in the Walt Disney World resort. It was great, but way too many people (and by people I mean drunken adults making asses of themselves) and we'll have to make sure to make alternate arrangements for the children if we decide to return. So anyway, I thought this would be a great time to look over some of the reveals from two recent events: New York Comic Con and Ringside Fest. Since 2006, Transformers fans have enjoyed the classics. Updated versions of G1 characters issued by Hasbro throughout the Classics, Universe, "Reveal the Shield" and Generations lines. 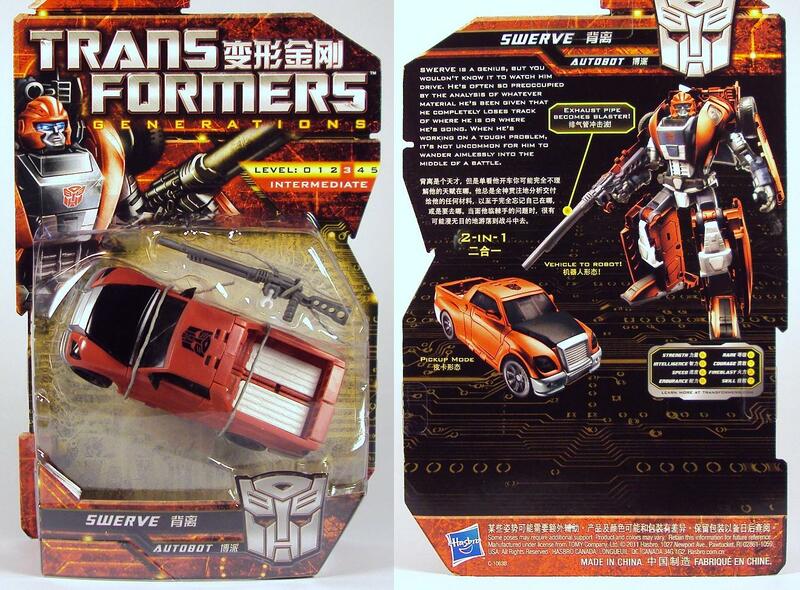 That also includes remolds and a few exclusives from Hasbro's Asian counterpart, Takara, via the "Henkei! Henkei!" and United lines. These lines have appeared between movie & animated TV show tie-ins lines so it can be understandably frustrating to complete the line. While you can find modern versions of nearly all the major G1 characters, you would be hard-pressed to find a "classics" Arcee figure. I'm postponing this week's edition of "The Honeypot" because I only picked up two items and felt it would make for a pitiful group shot. Instead I'm jumping right into a review of one of those purchases, Swerve from the newly released (at least in my area) Toys-R-Us exclusive "GDO" series. Just like fellow GDO release, Wheelie, Swerve is a remold of a previous release, in this case, Kup (masterfully reviewed at It's All True last year). You may notice some differences in the Kup figure pictured below, those are mostly attributed to modifications I've made with Repro Labels, but also includes the IDW-inspired iGear head and painted wheels. So don't freak out if you think you missed a better version of Kup on shelves. It's all "after-market" upgrades! Now, on to Swerve! Take a trip to anywhere in pop culturedom. What fictional town, time, or world would you want to visit? I started rearranging my display in late September and was almost done before I realized we're heading into October and Halloween. Dammit! So I decided to change it up and include some "spooky" toys for a more appropriate display. Of course, I don't have enough ghost/monster toys to fill up all my displays, so there are still plenty of superhero items around the room. Let's jump to it! The Honeypot: Transformers, Iron Men & the Demon's Head! This week's haul is heavy (really heavy!) 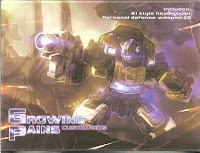 on the transforming robots with a few comic & movie-based toys tossed in for good measure! Hit the "SWARM" button and see what all filled the pot during the second week of October! Write a “State of the Site” for your web site. How’s it going? What exciting things have happened this past year? Where do you want your site to be in a year’s time? Well, I think the time is just right for this topic. There have been lots of changes at 3B's Toy Hive, both on screen and behind the scenes. Click ahead and get I'll give you the rundown of how it's going! It's been two months since my last WWE review and I'm sure some of you will agree that's just too long. 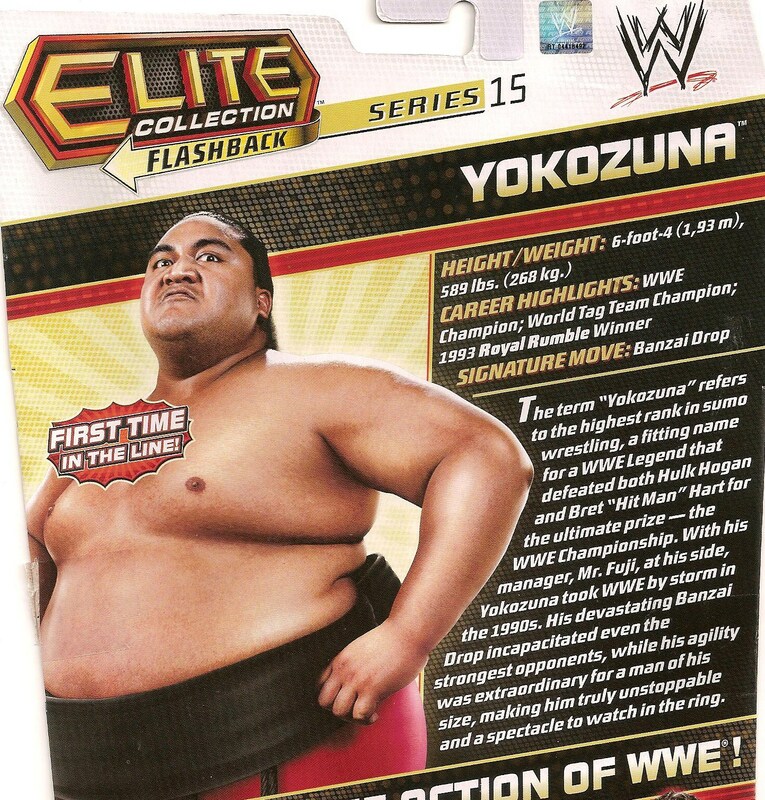 So today I'm back with a new WWE action figure review, this one takes a close (and I do mean CLOSE) look at another Legends Elite Flashback release, Yokozuna. 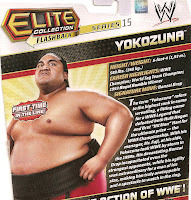 In the old WWF, Yokozuna was known for being a particularly monstrous heel. His grudge matches with the Undertaker led to the inclusion of the devious casket match as a WWE signature event. In fact, Yoko is the reason for the over-sized casket used in a lot of those matches. To say he's big is an understatement. "Just how did Mattel pull off such a massive body style? ", you ask? Jump ahead to read the review! We've reached then end of the first week in October and the "gets" are off to a great start! This week I finally found some Marvel Universe wave 19 figures, a second Vehicon trooper for my Transformers: Prime collection, a hard to find (at retail prices, anyway) Joe figure and a couple more Marvel mini-busts from Bowen! Last week I featured the Cliffjumper custom I created using Beezleboss' Devil Horns kit. Today I'm taking a look at another one of their upgrades, this one serving to transform Takara's gold-finished Bumblebee figure from the United line into a modern version of his upgraded G1 self, Goldbug. In today's review I'm taking a look at Wheelie from the Transformers: Generations line. He's part of a series that was originally going to be an Asian market exclusive (referred to as the "GDO" series), but was eventually picked up as a Toys R Us exclusive here in the States. Now, if you're expecting me to come up with clever rhymes for this review, you're out of luck. However, you can refer to Wheelie's TF Wiki entry which is entirely written in rhyme. I can't gaurantee you won't go insane after reading it, though, so proceed at your own risk. Read on to find out why I added Wheelie to my collection!